Safety nets. The name of the net immediately indicates the goal: ensuring safety. Safety nets are also popularly referred to as fall nets, safety nets, fall protection, fall protection nets and construction nets. Nets Specialist J. van Dijk and Sons is a leader in the field of fall protection. We make and assemble safety nets for every height and surface, and for every situation. Quality is our top priority. We therefore make high-quality safety nets that comply with the latest standards. 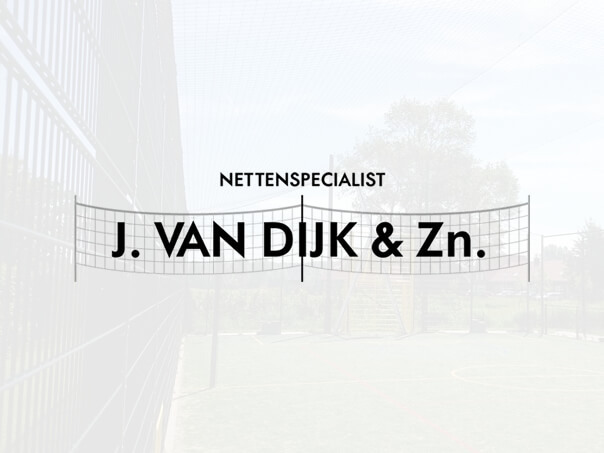 We are even so adept and driven in the making and installation of safety nets, that European standardization NEN1263-1 is named after the director of Nets Specialist J. van Dijk and Sons! We have three different safety nets according to this standard, a black variant and two white variants. The safety nets can be mounted horizontally and vertically. The safety nets of Nets Specialist J. van Dijk and Sons are generally used in construction. Is it important for your (construction) project that small and fine materials, such as dust, stones and tools, cannot fall down? No problem! The team of Nets Specialist J. van Dijk and Sons can weave a scaffolding cloth in the safety net, which ensures that small material does not fall down. When making safety nets, Nets Specialist J. van Dijk and Sons use the following materials that meet the latest standards. Knotted nylon safety nets in accordance with the European standard EN1263-1. The nets can be produced in any size. Polyethylene knotted safety nets are approved according to Lloyds' inspection and are often used in construction and in stairwells. It is therefore not surprising that this type of safety net is also called safety nets for people.